The escalating violence on the streets of Sudan is a conscious and lamentable decision made by the regime, which is now apparently trying to stem the protests and hide its human rights violations by blocking access to the internet in Sudan. The popular momentum behind the protests in Sudan has been clear to see. Journalists and citizens have provided a vital window into the courage of the Sudanese people and their determination for change. The international community is already failing to pay the protests the attention they deserve. No action has been taken to prevent further violence, injuries and deaths. Without the ability to communicate with the world, Sudan might fall further from international consciousness. 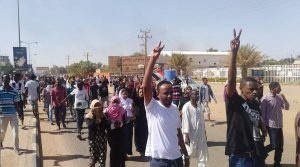 Blocking internet access would be yet another attack on the Sudanese people, and a blatant attempt to draw a shroud over the violence and desperation of the regime. We note in particular that Sudanese women have remained in the forefront of the peaceful protests and strike. They continue to brave the regime’s attacks, which disproportionately target women protestors. Several women activists are being beaten on the streets and inside their homes when security forces invade their homes, while other women are being arbitrarily detained and tortured in the regime’s prisons. The international community must recognize the legitimacy and humanity of the protestors, it cannot stand by in silence, it must work to end this massacre.